Actually, I have a better question—where has all this TIME gone?? I can’t answer these questions in full, unless I start tracking what the past few months have meant for my sister, CASLN, and myself. Even then, such a whirlwind has gone by, I don’t remember half the month of June! Back in April, I was busily setting up new clients at work (private behavioral therapy agency) and starting the transition process with current clients to a substitute manager. I was traveling to Europe from May 15-June 12, and needed all my ducks in a row before boarding that plane, or so help me God. I spend early April submitting my application to the Behavior Analyst Certification Board, received my approval to sit for the exam, and nearly had a heart attack when I discovered the FIRST available spot to take the exam was the DAY before my Europe trip, 100 miles away from me in San Diego. Still in April, I prepared for two presentations: one for my alma mater, Flintridge Sacred Heart Academy, and one for Dr. Barbara Wheeler’s class at Cal State Los Angeles with my colleague, Eunice Im (check out her amazing blog post about it)! I was invited back to my high school to speak at their Autism Awareness Assembly, and I spoke about what ‘Disability Awareness’ means to me and how we are all called to embrace differences and accept—no, celebrate!—people for the uniqueness inside them. Then came the month of May—mad, manic May. I was studying for the BCBA exam, transitioning cases to a substitute, prepping parents for my upcoming four-week leave, all while trying to balance some regular sleep each night. I read the Cooper book feverishly, attempting to catch up to colleagues who had been studying (supposedly studying) about five more hours than I had been. I packed for my overnight in San Diego, I packed for my European excursion. The first two weeks of May were a wild and crazy mental tornado, but somehow, I managed to get to May 13th. When I left the exam room after taking the exam, I was glad I was finished with it, but now came the monumental task of driving back up to Los Angeles to finish packing for four weeks away. I did sleep, but had nightmares of forgetting the most basic of basics, like toothbrush or underwear. In a word, Europe was monumental! I had never visited any other continent before, and I was seeing Europe for the first time through the eyes of a queen! My parents took my brother and me to some of their favorite spots, and I got to fall in love with some of my very own. I was humbled. Traveling in Europe was no longer something trendy and glamorous that celebrities did between working on sets. I was in another country, visiting another continent, living a whole different way of life, and I got to experience it as a foreigner, a visitor, someone who was looking to a whole other world for the way to exist in theirs. It was truly inspiring. When we came back, the work only multiplied, as I hit the ground running with my cases at my agency. I started to manage the details of my cases, the tedious minutiae, like which columns to place next to each other in my clients’ Excel files. I was fine-tuning myself as a manager in a way I hadn’t been able to prior to my trip, because my focus had been on getting the cases ready for the substitute. Now, the cases were all mine to personalize, to own, to sign, to mold, to create, to recreate, to master. My role as a new manager had begun. Then I got the news! I was driving on the 134 freeway heading toward Old Town Pasadena when my phone dinged in my cupholder. 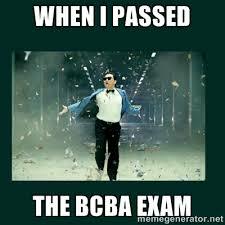 The email subject line flashed at me: BACB EXAMINATION RESULTS. I’m pretty sure I almost killed like, fifty people, I was so excited and nervous and afraid and excited and AHHH!! My friend was celebrating his birthday that night—would it be selfish of me to open it and see what the results were before heading to the bar? I drove off the off-ramp, made my turns onto Green Street, and safe in my Pasadena happy place, I opened the email, not even realizing I had been digging my nails into my wrists through sheer nervous excitement! Years of hard work and dedication to this process had led me to this moment!!! When people spoke of others’ working toward a passionate ambition, they spoke in admiration of them “going places.” Well now, here, there, in that moment, I knew that I had arrived. It felt like graduation all over again, the commencement, the beginning at the end of the path when I’d reached the pinnacle of all I had done to go, to be on my way, to prepare, to create a life of change, to march the destiny I’d created for myself through years of paying my dues! I was here. I had arrived. And now, after a couple weeks of celebrating (when you pass this exam, you get ALL the attention from everyone in this field for a solid month! ), I am back. Where have all the blog posts gone? They’ve been working toward this moment.